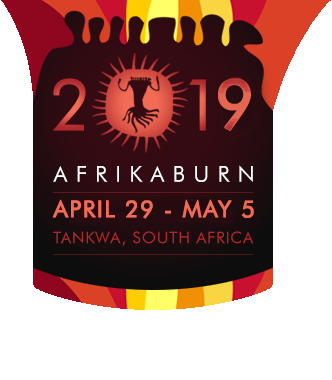 It would be true to say that the most dangerous thing about AfrikaBurn is travelling to & from it, on the R355. It’s the longest road in South Africa without cellphone signal or roadside assistance. And in the last 11 years, there have been numerous collisions, many rolled vehicles – and more than one fatality*. It’s a fact that even when the many thousands of people that participate in AfrikaBurn aren’t travelling the R355 between Calvinia in the north and Ceres in the south, accidents still occur. The reasons for this are various: sidewall punctures by sharp fragments of shale rock cause tyres to have blowouts, and dusty conditions cause reduced visibility. In addition, the sheer distance travelled on a road that’s very straight has seen drivers fall asleep at the wheel, with predictably disastrous consequences. When the many thousands of people participating in AfrikaBurn travel the road, with heavily loaded vehicles and some travelling beyond the recommended speed limit of 70km/h, the number of incidents increases – and though our team regularly post road safety notices, and our Survival Guide and WTF Guide both include strong advice to drive slowly and safely, we need to do more to reduce the danger to our community and that of the Tankwa Karoo. To this end, we are starting a series of meetings that are aimed at developing a more comprehensive road safety plan by bringing together all interested parties in our community and beyond. The outcomes of these meetings will be a plan that includes increased partnership with local and regional traffic authorities in the Western and Nothern Cape, as well as far more visible signage and traffic calming measures. We’re looking for anyone with a background in traffic management, or anyone with innovative ideas that could be applied to the way in which traffic to and from our event site in the Tankwa Karoo can be made safer for all concerned. The first of these meetings will be held at our offices in (178 Lower Main Rd, Observatory, Cape Town) on Thursday 20th July at 5:30pm – and if you’re interested in assisting our team developing our road safety plan further, or have ideas you feel could be applied effectively, you’re welcome to attend. Please mail [email protected] to confirm attendance – and if you know of anyone who might be interested in assisting, let them know. *for info and updates on the road collision that resulted in a fatality after our event this year, see this page.